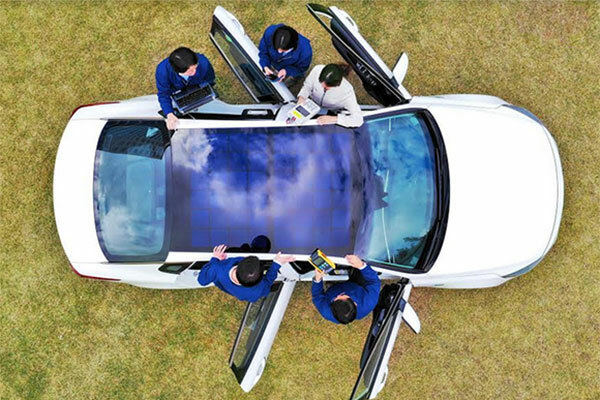 Electricity-generating solar panels will be incorporated into the roof or the hood of vehicles, and will support internal combustion, hybrid and battery electric vehicles with additional electrical power, increasing fuel efficiency and range. When a 100W solar panel is equipped, in 1 Sun standards (Summer noon, 1000 W/sq m intensity of radiation) it produces 100Wh of energy per hour. In the controller, Maximum Power Point Tracking (MPPT), which controls voltage and current to increase efficiency of the electricity collected in the solar panel, and source transformation take place.